Mohamed Elibiary is that hottest of commodities: The moderate Muslim who will stand forthrightly against terrorism. Youthful, engaging and well-spoken, Elibiary’s star has been on the rise for years. In October 2010, Department of Homeland Security (DHS) Secretary Janet Napolitano named him to the Homeland Security Advisory Council. But as so often happens with Muslims that the media or government rushes to anoint as the Great Moderate Hope (remember, the New York Times praised Anwar al-Awlaki as a moderate after 9/11), Elibiary is now under a cloud. He is suspected of leaking highly sensitive intelligence documents to a media outlet - and Napolitano is stonewalling. Investigative journalist Patrick Poole reported at PJ Media last week that “Elibiary may have been given access to a sensitive database of state and local intelligence reports, and then allegedly shopped some of those materials to a media outlet.” According to Poole, Elibiary approached “a left-leaning media outlet” with reports marked For Official Use Only that he said demonstrated rampant “Islamophobia” in the Texas Department of Public Safety (DPS). The media outlet declined to do a story, but what was Elibiary doing shopping them Official Use Only documents in the first place? Mohamed Elibiary has advised numerous federal, state and local law enforcement organizations, including the Texas Department of Safety, and National Counterterrorism Center Global Engagement Group on matters relating to homeland security. Recently, Elibiary served on DHS' Homeland Security Advisory Council Countering Violent Extremism Working Group, and currently serves on the Texas Department of Public Safety Advisory Board. Elibiary has been working along such lines for many years. Yet there have been questions about his moderate bona fides for a number of years as well. He was one of the speakers at a December 2004 conference in Dallas titled "A Tribute to the Great Islamic Visionary." The visionary in question was none other than the founding father of the Islamic Republic of Iran, the Ayatollah Khomeini. When questioned about his appearance at such a conference, Elibiary claimed that he hadn’t known what kind of conference it was going to be, although he did not explain why he went ahead and appeared there anyway once he found out. Among those who found this explanation wanting was journalist Rod Dreher of the Dallas Morning News, whose skepticism angered Elibiary. The great moderate subsequently threatened Dreher, telling him: "Expect someone to put a banana in your exhaust pipe." Ah, inclusiveness - what could be more important? Dare I suggest that a genuine concern for national security ought to trump even that most sacred of things, inclusiveness and diversity? 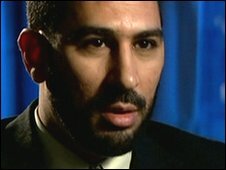 Mohamed Elibiary has risen as far as he has without ever being properly vetted because government and law enforcement officials, and the media, are so avid to find a moderate Muslim who will stand against Islamic jihad terrorism that they will accept virtually anyone’s claim to be just that, no questions asked. The Mohamed Elibiary incident, whether or not the allegations against him are true, should lead officials to be more careful in the future, and perhaps even to adopt a more realistic view of Islamic belief and its implications for terror and national security. But it won’t.